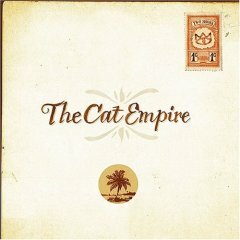 Nearly three-quarters of the way through its sophomore outing (and its American debut) Two Shoes, The Cat Empire declares that it has "got a party happening, and it’s gonna be seeing the break of dawn." For a band that is, for all intents and purposes, defined by the feel-good grooves that it lays down, this sentiment is a bit of an understatement. Not only does Two Shoes begin with the pulsating, horn-splattered Sly, which conjures images of Ray Davies hanging out in Havana with Sam & Dave, but as it continues, the Cuban rhythms that The Cat Empire has embraced also rocket to the fore on tunes like In My Pocket. Similarly, The Car Song sounds like AC/DC’s Bon Scott has returned from the dead to front a bubbly funk outfit, while hints of everything from reggae to hip-hop to jazz circulate through all of the group’s joyously sun-baked arrangements. Lyrically, Two Shoes falters as The Cat Empire attempts to straddle the line between lighthearted and serious concepts. The band counters, for example, The Car Song’s playful absurdities ("It’s Monday bloody Monday and there’s two things I forgot / I forgot to do my homework, and I’ve only got one sock") with The Chariot’s idealized vision of saving the world through music. In the end, however, its youthful ruminations matter little as The Cat Empire’s exuberant energy and giddily resplendent music are enough to make Two Shoes a captivating endeavor that surely will defeat even the worst cases of the winter blues. Two Shoes is available from Barnes & Noble.